Matthew Baldwin, a Pro-Style Quarterback, committed to the Ohio State Buckeyes and it's Head Coach, Urban Meyer this week. Baldwin's football career started in high school at Lake Travis in Austin, Texas. Baldwin, like many young adults, changed his mind at the last minute. Matthew Baldwin originally committed to attend and play for the Colorado State Rams. On November 30th, 2017 Baldwin withdrew his, Colorado State, letter of commitment. Shortly afterward, Baldwin announced his commitment to play for coach Urban Meyer and the Ohio State Buckeyes. 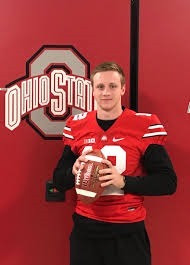 On November 11th, Baldwin toured the Ohio State facilities during an "unofficial" visit to the campus. This visit happened to coincided with the rivalry game against Michigan State University. Matthew Baldwin enjoyed watching the Ohio State Buckeyes crush the Michigan State Spartans 48 to 3. Baldwin made the trip to the Columbus campus with his mother. Mathew Baldwin and his mother left the campus visit happy with a scholarship offer from the Ohio State Buckeyes.